Figure 3-2. 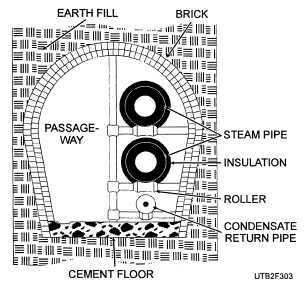 - A typical manhole for distribution system. 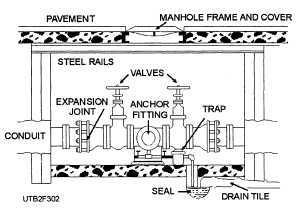 house the necessary valves, traps, and expansion joints. A typical manhole is shown in figure 3-2. The utilidors, or tunnels, of the utilidor type of system are constructed of brick or concrete. The size and shape of the utilidor usually depend upon the number of distribution pipes to be accommodated and the depth the utilidor must go into the ground. Manholes, sometimes doors, are installed to provide access to the utilidor (tunnel). A typical utilidor is shown in figure 3-3. The utilidor is usually constructed so the steam and condensate return lines can be laid along one side of the tunnel on pipe hangers or anchors. This is usually done with the type of hanger with rollers that provides for free movement required by the expansion of the pipe. The other side of the utilidor should be a walkway that provides easy access to lines when you are inspecting and doing maintenance. Figure 3-3. - A typical utilidor. Overhead distribution systems are often used in temporary installations; however, they are sometimes used in permanent installations. The main drawback to this type of distribution system is the high cost of maintaining it. These overhead systems are similar in many respects to underground distribution systems. They require valves, traps, provision for pipe expansion, and insulated pipes. 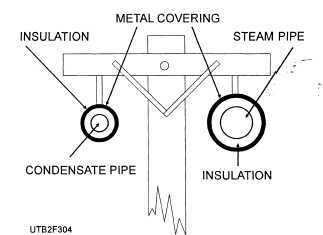 The main difference is that the steam distribution and condensate return piping are supported on pipe hangers from poles, as shown in figure 3-4, instead of being buried underground. In some cases, you will find that steam and condensate lines are laid in a conduit along the surface of the ground. These systems, however, are not as common as overhead and underground systems. Surface systems require about the same components as the overhead and the underground systems - traps, valves, pipe hangers to hold the pipes in place, and provision for pipe expansion. Sometimes an expansion loop, formed by a loop of pipe, is used instead of an expansion joint to provide for pipe expansion. Figure 3-4. - Steam and condensate lines supported by poles.